Yorkshire is a historic county of northern England and the largest in Great Britain. Although Yorkshire is not a current unit of civil administration, it is included in the name of a number of contemporary subdivisions such as Yorkshire and the Humber. The name is familiar and well-understood across the United Kingdom and is in common use. The area was an independent Viking kingdom known as Jórvík for around a century, before being taken by England. Most of the modern day large cities were founded during the Norman period. Yorkshire is widely considered to be the greenest area in England, due to both the vast rural countryside of the Yorkshire Dales, North York Moors and some of the major cities, this has led to Yorkshire being nicknamed God's Own County. Yorkshire and the Humber is formed by the following counties: Yorkshire, Northern Lincolnshire and Humberside. The moors and dales that make up most of North Yorkshire spread from the Pennines to the sea – a landscape as varied as anywhere in England and dotted with some of the country’s loveliest and most historic towns and cities. Medieval monks build their abbeys – Bolton Abbey, Fountains Abbey, Jervaulx Abbey and Rievaulx Abbey – in the broad dales and the Vale of York, watered by crystal clear rivers spilling down from the Pennines. Tough ruined now, the abbeys are still lovely sights, standing in their peaceful settings below hills, where sheep graze amid an embroidery of dry stone walls. North of the historic city of York lie the Howardian Hills, setting for the lordly Castle Howard. Beyond the land rises to a heather clad plateau and the dramatic escarpment of Sutton Bank. Eastwards moorland extends to the coast, where a fringe of high cliffs is broken by towns as contrasted as Whitby and Scarborough. The West Yorkshire area has been associated with wool since medieval times and the developing techniques of its industry are graphically recreated in living museums at Bradford, Calderdale and Leeds. The little worsted town of Haworth has another claim to fame as the home of the Bronte family of authors. Wealthy textile moguls built Cliffe Castle and Red House and the life of their works is recreated at Kirkstall Abbey. Harewood House is a monument to another source of wealth: the sugar trade. Below is North Yorkshire and its neighboring areas. Scotland starts at the northern border of Cumbria and Northumberland. The border with Scotland is 77 miles by road from the Manor of Hartforth in North Yorkshire. Yorkshire Dales National Park. Hartforth is nearby Richmond, in the top right of the park. An army of Danish Vikings invaded Northumbrian territory in 886 AD, with what was named by their enemies as the "Great Heathen Army". The Danes took what is modern day York and renamed it as Jórvík, making it their new capital city of a kingdom under the same name; the area which they took as their kingdom was Southern Northumbria (Yorkshire). 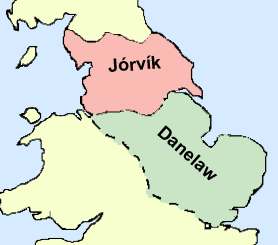 The Danes went on to conquer a large area of England which afterwards became known as the Danelaw, but whereas most of the Danelaw was still English land, albeit in submission to Viking overlords, it was in the Kingdom of Jórvík founded by Halfdan Ragnarsson, that the only truly Viking territory on mainland Britain was established. Although it was founded by Danes, the kingdom was passed onto Norwegian kings. Through the Vikings evolving trade, Jórvík was able to trade with the British Isles, North-West Europe, the Mediterranean and the Middle East. Eric Bloodaxe King of Norway (Anton's 33rd Great Grand Uncle), who was the last independent Viking king of Jórvík is a particularly noted figure in history. After around 100 years of a Norse-Yorkshire kingdom, the Kingdom of Wessex gained control of Yorkshire and the North in general, placing Yorkshire within Northumbria again - which was now an almost-independent earldom, rather than a separate kingdom. The Wessex Kings of England were reputed to have respected the Norse customs in Yorkshire and left law-making in the hands of the local aristocracy. The Dales is a collection of river valleys and the hills in between them, rising from the Vale of York westwards to the hilltops of the main Pennine watershed (the British English meaning). In some places the area even extends westwards across the watershed, but most of the valleys drain eastwards to the Vale of York - into the Ouse and then the Humber. "Dale" comes from a Nordic word for valley, and occurs in valley names across Yorkshire (and northern England generally) but since the creation of the Yorkshire Dales National park, the name "Yorkshire Dales" has come to refer specifically to these western dales (the area of dales and hills EAST of the Vale of York is now always called the "North York Moors" after the National Park created there). Confusingly, the Yorkshire Dales have plenty of moors, too. 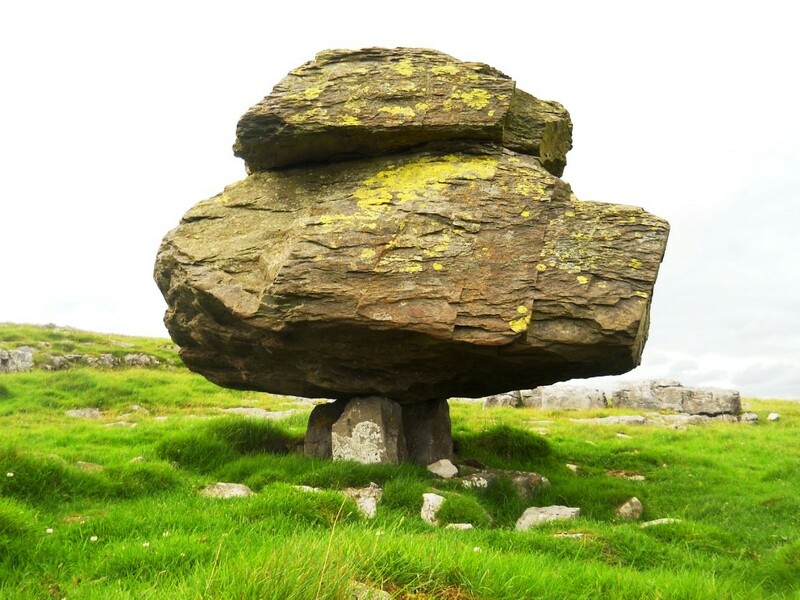 In the park, you will find the Norber Erratics - beautiful rocks left over from the ice age.